The Faces Of My Family: New Genealogical Society Blog! 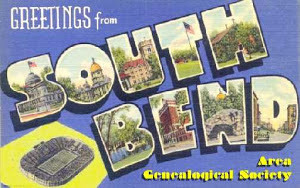 The South Bend Area Genealogical Society has started a brand spanking new blog! We've noticed our society members are becoming more social media savvy and the society is answering this trend with our newest venture! Please visit the blog at www.sbags1.blogspot.com! While you are there be sure to click the postcard which will link you to our website. There you will find databases of interest to anyone researching in St. Joseph County, Indiana. If you are a local society with events in the area, be sure and contact us at sjcgensoc@gmail.com to have your event added to our calendar.